We start by listening to your needs, your fears, and your dreams so we can craft a unique wealth plan to meet your personal and financial goals. From investing capital to budgeting for future needs and wants, and from family legacy planning to charitable giving, our team is committed to maintaining, growing, and investing your assets for the long term. Prior to starting Sheppard Wealth Management, John worked for Freestone Capital Management as a Client Advisor in their Santa Barbara, CA office before opening a satellite office in Bend, OR. Before joining Freestone, John spent nearly ten years within the Private Bank of Wells Fargo, serving as a Senior Financial Advisor and Vice President of Investments, where he counseled sixty families. Earlier in his career, John served as Portfolio Manager and Director of Sales for Peritus Asset Management, a boutique high-yield bond firm based in Santa Barbara. 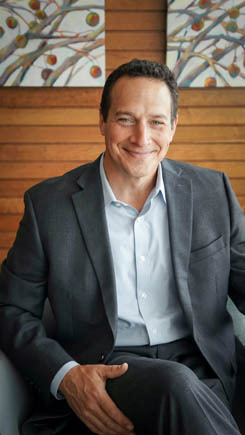 John began his career in financial services in 1998 with Merrill Lynch Private Client Group, where he worked with a team managing over $300 million in client assets for a select number of individuals, families, businesses, and non-profits. John earned his BA from Westmont College, and has been awarded the Accredited Asset Management Specialist (AAMS®)* designation for the College of Financial Planning. Additionally, he has been recognized by Cascade Business News as Accomplished Under 40 for Impressive Careers with Social and Philanthropic Commitment. John currently serves on the Board of Directors for The Lord’s Chips, a nonprofit organization dedicated to improving the quality of life for orphans in Mexico. He also supports the Organizing Committee for 100 Men Who Care Central Oregon, a crowd-sourced philanthropy group raising awareness and money for local charitable organizations. John and his wife reside in Tumalo, OR with their four children where they enjoy their hobby farm and all the endless outdoor activities Central Oregon has to offer. *The Accredited Asset Management Specialist designation is awarded by the College for Financial Planning to financial professionals who successfully complete a self-study program, pass an exam and agree to comply with the AAMS® Code of Ethics. Andy has served the Eugene area as an investment professional for the past 32 years. Andy has extensive experience managing diverse portfolios for families and business owners, and was a Senior Vice President with a national investment firm before joining Sheppard Wealth as a Principal Owner and Wealth Manager. In addition to his work with investment clients, Andy volunteers as the board President for Agape Youth Services, a non-profit that seeks to bring hope and healing to Oregon children and families impacted by incarceration. He is also the founder and director of Genesis Reintegration Program, a support program for men transitioning out of prison. Andy and his wife Heather are deeply rooted in the Eugene, OR community, and are passionate about advocating for children. They have a long history working within the foster care system, and have been local advocates for adoption. They love spending time with their seven adult children and six grandchildren. Before joining Sheppard Wealth, Lauren spent several years with the East Cascades Workforce Investment Board (ECWIB). Lauren was responsible for growing the organization from a single staff member to a fully staffed non-profit. In her capacity as Senior Program Manager, Lauren also worked closely with the State of Oregon, the Department of Labor, and Local Elected Officials to oversee and manage the implementation of federally regulated workforce and training programs. Lauren continuously seeks out ways to care for people and build the social structures within Central Oregon. She volunteers to serve with local non-profits and network larger systems to provide long term improvement for the community of Central Oregon. Lauren and her husband Jerell enjoy hiking, riding dirt bikes, and exploring the beauty surrounding Bend. In her free time, Lauren mentors young people in the area and volunteers with her church. If you'd like to get to know us better, please feel free to subscribe to our quarterly client letter. copyright 2019 Sheppard Wealth | site by Caston + Co.